The traditional manicures are a great way to keep your fingers looking glamorous. But once in a while, when you want to unleash your creative spirit, how about opting for a trendy new style for your nails as well? Nail art is an excellent and currently a highly popular way to show off your fashionable edge. But if you don’t want to spend too much on expensive nail grooming treatments at the salon, you can try simple and cute nail art designs at home as well. We are here to show you how. 1. Use tape to create sections: One of the simplest ways of having stunning nail art is to use scotch tape to mark off sections of your nails and then painting each part a different shade. You can go crazy experimenting with patterns to your heart’s content. Just remember to let each coat dry off completely before applying tape over it. 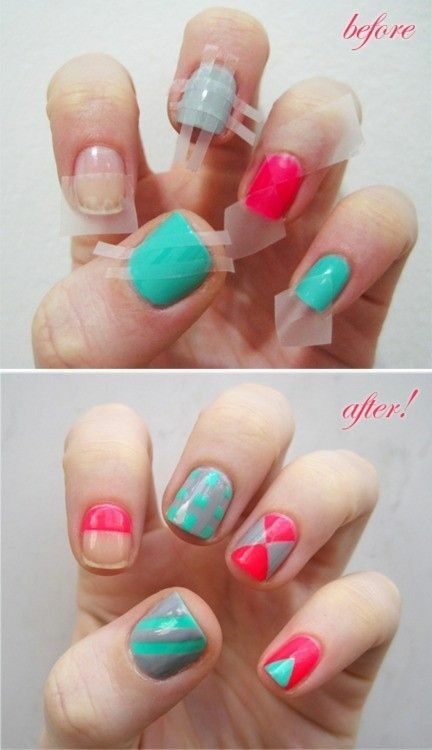 It is best if you use the easy peel, paper tape so that it doesn’t pull off the layer of nail polish. To begin, choose two to three shades of nail polish which complement each other. Now paint over each nail in different colors. After the layer of polish has dried completely, cut thin strips of tape and stick them on your nails. You can try different styles – stripes, triangles, zig zag patterns, color block sections etc. Then apply a different shade on each finger to create an interesting effect. 2. Polka dot patterns: Nothing screams fun and retro style like polka dots. Small or large, this adorable pattern is always trendy and looks playful. And the best part is that it is super easy to do it yourself. To start with, paint your nails with a base coat with the color of your choice. Next, take a bobby pin and dip it in the shade of nail polish that you want to create the dots with. Slowly and carefully dab the bobby pin with the drop of paint on your nail. Apply it gently so that it leaves just a small dot and doesn’t smudge. For smaller sized polka dots, you can use a toothpick instead of a bobby pin. If you want a classic style go for a white base with black polka dots or vice versa. For a more upbeat and innovative style, mix up contrasting colors like blue and yellow, or pink and green. Have fun with your fashion. 3. Lace-y nails: Give your nails a snake-skin look by using lace as a pattern maker. Apply a base coat of clear nail polish and let it dry completely. 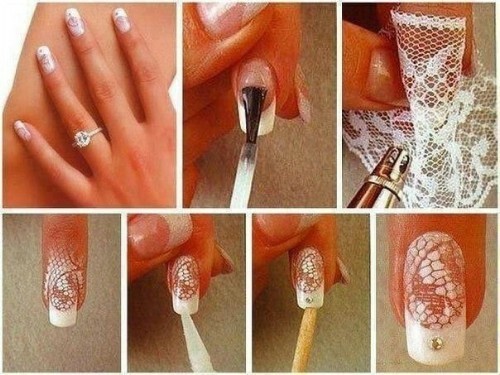 Then hold an old piece of lace over your nails and paint over it with a shade of your choice. The color will create an interesting form through the gaps in the lace giving you a super stylish nail art design with minimal effort. All your friends are sure to be asking where you get your nails done from! 4. Love is in the air: If you are feeling a little extra lovey-dovey, how about showing it off on your nails too? It’s extremely simple to do. Just apply a base coat of nail polish on your nails. Opt for a pale color on which a red heart will stand out. Then dip a sharp toothpick into some red nail polish and draw two dots close to each other on your nails. Make sure they are of equal size. 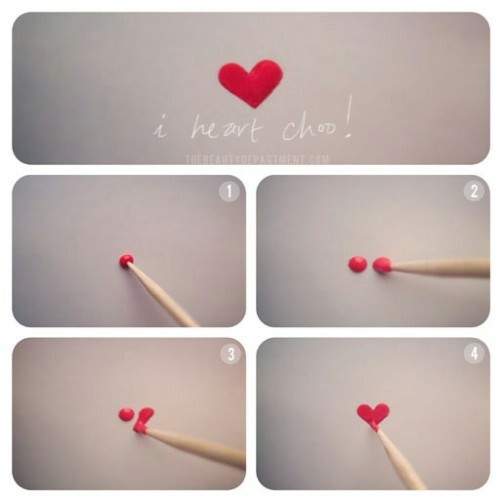 Then drag the toothpick down from each dot at a 45-degree angle and make the lines meet to create an adorable heart shape. This is a perfect style for your upcoming anniversary date or even for a beautiful Valentine’s day celebration. And it’s so quick and easy to do! 5. Create ripples with plastic: This super easy nail art design will keep your friends wondering how long you spent getting your nails done. In truth, it will just take you a few minutes. Apply a base coat and let it dry. Then crumple up some plastic and dip it in the second shade you choose (We love this combination of turquoise and gold). Lightly dab the plastic on your nails to create a splattered effect that looks uber stylish and amazingly glamorous.